P3 AND CONNECT HAVE BEEN TESTING THE DUTCH MOBILE NETWORKS SINCE 2015. GIVEN THE HIGH NETWORK PERFORMANCE, IT IS REMARKABLE THAT THE RESULTS STILL HAVE IMPROVED OVER THE YEARS. ANOTHER CONSTANT IN THE NETHERLANDS ARE FREQUENT MERGERS AND ACQUISITIONS AS WELL AS SIMILAR CHANGES IN THE MARKET ENVIRONMENT. HOW WILL THE NOW THREEDUTCH OPERATORS PERFORM THIS TIME? The P3 connect Mobile Benchmark in the Netherlands has traditionally shown strong results. This trend continues in 2019, resulting in three “outstanding” grades with two of the contenders keeping the high scores they achieved in the previous year and one of them even improving them. P3, headquartered in Aachen, Germany, is a world leader in mobile network testing. The company has over 3,500 employees worldwide and a turnover of more than 350 million Euros. P3 is partnering with the international telecommunications magazine connect, which has more than 25 years of editorial expertise and is one of the leading test authorities in Europe for telecommunications products and services. P3‘s network benchmarks are widely accepted as being highly objective and defining the de-facto industry standard. The carefully designed methodology of the 2019 benchmark in the Netherlands combines drivetests and walktests for executing detailed voice and data measure­ments under controlled circumstances with a sophisticated crowdsourcing approach. This provides profound insights into the overall coverage of voice, data and 4G services, real-world User Download Speeds and Data Service Availability. Together, P3 and connect have been conducting the most important network benchmark test in Germany for more than 15 years, extending it to Austria and Switzerland since 2009. Starting in 2014, P3 has also been con­ducting benchmarks in the UK and Australia, expanding its public mobile network tests to the Netherlands, Spain and Sweden in 2016 as well as examining many other mobile networks all over the world including those in the USA and Singapore. The 2019 P3 connect Mobile Benchmark in the Netherlands consists of drivetests and walktests conducted from February 12 to March 1, 2019. Two drive test cars together covered about 6,490 kilometres, visiting 21 cities and 31 towns. Additionally, a walktest team visited seven cities and travelled on trains bet­ween 14 destinations. The test areas account for approximately 5.7 million people, or about 33.5 per cent of the total population of the Netherlands. P3‘s holistic approach to network benchmarking includes both drivetest and walktest measurements as well as crowdsourcing. The drive and walktests allow for evaluating the cutting edge of the networks‘ capabilities. Crowdsourcing unveils the service quality, performance and coverage actually experienced by the users. We have thoroughly weighted these components in order to give a realistic and authoritative assessment of the rated networks‘ true potential and performance. For the fourth time in a row, T-Mobile is the clear winner of the P3 connect Mobile Benchmark Netherlands. KPN and Vodafone follow at some distance, but also achieve the grade “outstanding”. With their scores only two points apart, they show practically the same level of performance. Also, the fact that all three Dutch ope­rators are graded as “outstanding” emphasises the very high performance level of the Dutch mobile networks. T-Mobile clearly leads in all tested disci­plines inclu­ding the newly introduced crowd score and achieves the highest score level ever determined in our Mobile Benchmarks. KPN shows the biggest score improvement in comparison to its results from the previous year. 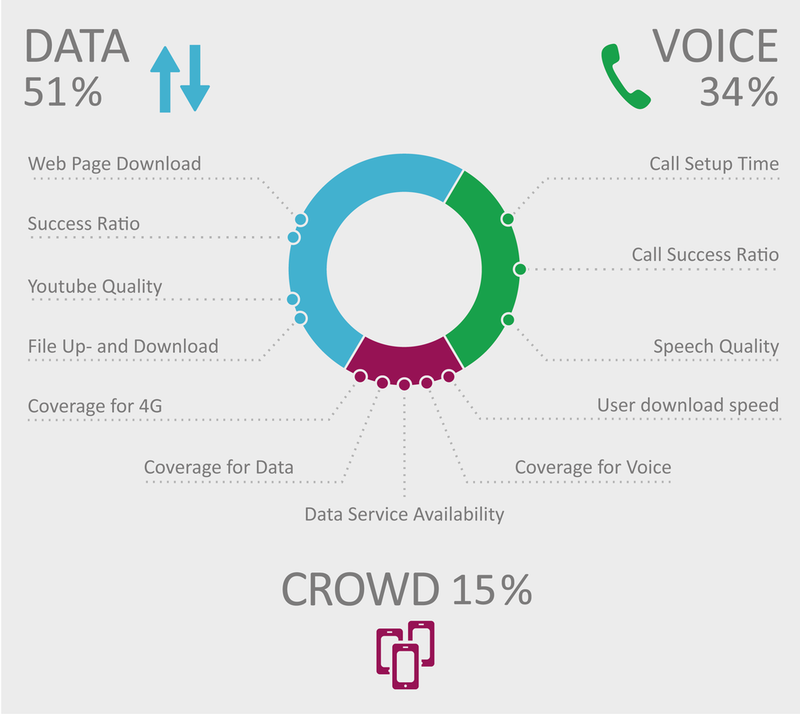 This operator scores slightly better than Vodafone in the Voice and Crowd categories and is particularly strong in the Voice tests in smaller towns and in the Voice and Data tests on connecting roads. Vodafone slightly outperforms KPN in the data category and shows strong results in the walktests in bigger cities. 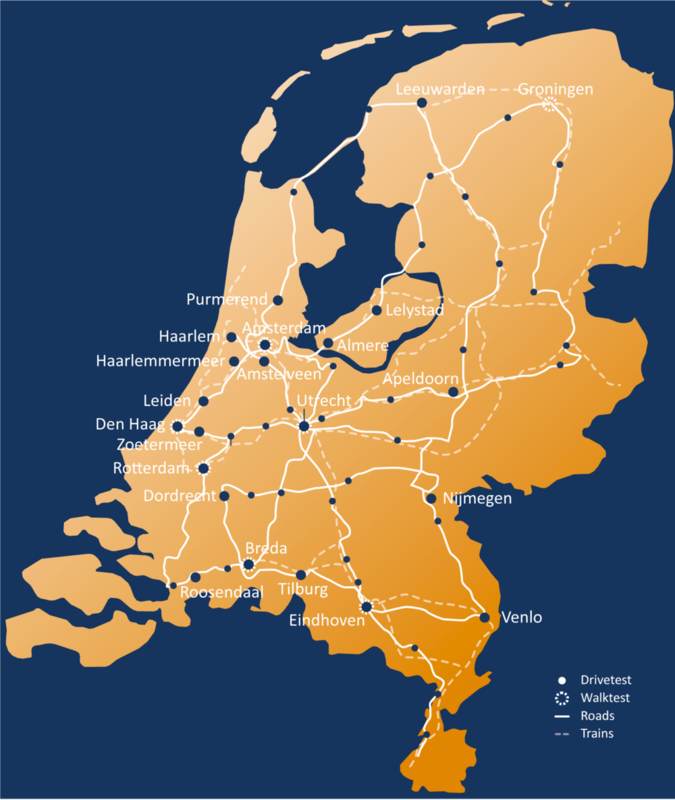 Especially in the data measurements conducted on Dutch trains, the operators leave some room for improvement – however, compared to some neighbouring countries, they still perform very strong in this discipline. TRADITIONALLY, THE MOBILE OPERATORS NETHERLANDS COMPETE ON THE HIGHEST PERFORMANCE LEVEL. THE RECENT ACQUISITION OF TELE2 BY T-MOBILE NARROWED THE NUMBER OF OPERATORS DOWN TO THREE, DISTINCTLY CHANGING THE MARKET CONDITIONS. The Koninklijke PTT Nederland N.V. emerged from the privatisation of the formerly state-owned PTT in 1998. For the fiscal year 2018, the com­pany reported a total revenue of 5.7 billion Euros as well as a customer base of 5.5 million consumer and business postpaid subscribers plus 1.3 million fixed-mobile phone plans. By these numbers, KPN is clearly the largest Dutch mobile operator. In addition, KPN reports 2.9 million fixed broadband and 2.2 million interactive tv customers plus 610,000 “business multiplay” workstations. The company focuses on marketing its KPN brand, however with Simyo, Telfort and Ortel it also has offerings in the “no-frills“ segment. KPN operates 2G/GSM at 900, 3G/UMTS at 900 and 2100 MHz and 4G/LTE at 800, 1800, 2100 and 2600 MHz. 3G is scheduled to be phased out by the end of 2021. KPN claims a 99.3 per cent coverage of the Dutch population with 4G. Recently, KPN has started to combine all of its LTE frequen­cies by “4 carrier aggregation” (4CA), which enables theore­tical download speeds of up to 1 Gbps. Furthermore, KPN has offered VoLTE since October 2016 and introduced 4x4 MIMO in March 2019. The Dutch subsidiary of the international Vodafone Group acquired the operator Libertelin 2003, forming Vodafone Netherlands. In 2016, it merged with the cable and fibre operator Ziggo. Today, 50 per cent of the joint company Vodafone Ziggo is owned by the Vodafone Group and another 50 per cent by Liberty Global. VodafoneZiggo is the second largest mobile operatorin the Netherlands with about 5.2 million mobile cus­to­mers. The company also specifies 3.9 million video, 3.3 million fixed broadband and 2.5 millionfixed tele­phony subscribers. For the calendar year 2018, Vodafone Ziggo announced amobile revenue of 3.9 billion Euros. The company operates 2G networks at 900 and 1800 MHz, 3G at 2100 MHz and 4G/LTE at 800, 1800, 2100 and 2600 MHz. It was the first Dutch operator to announce that it will phase out its 3G network by 2020 in order to devote its spectrum to 4G. Vodafone claims to offer more than 98 per cent population coverage with 4G and to offer up to 1 Gbps with “4G+“ (carrieraggregation). VoLTE was introduced in November 2016.
be­coming a “no-frills“ offer withinits portfolio. In 2007, T-Mobile NL additionally acquired Orange. T-Mobile‘s network offers 2G mostly at 1800 MHz, 3G at 900 and 2100 MHz and 4G/LTE at 900, 1800, 2100 and 2600 MHz. The company claims a 4G coverage of more than 99 per cent of the population and has been offering VoLTE since October 2017.